Welcome to Miami, Casa Tua Cucina The Mediterranean/Italian kitchen and marketplace finds a home in Saks Brickell City Centre Craving perfectly-crafted Italian and Mediterranean fare? Stop by Casa Tua Cucina, where you can enjoy classic and contemporary offerings made from the finest ingredients, Casa Tua classics, as well as new recipes created for the expansive menu. All menu items can be enjoyed in-house, for takeout, or catering. The gourmet Italian and Mediterranean restaurant and marketplace also offers a curated retail selection of home and kitchen accessories, crafted by local and international artisans, as well as Casa Tua private label products. 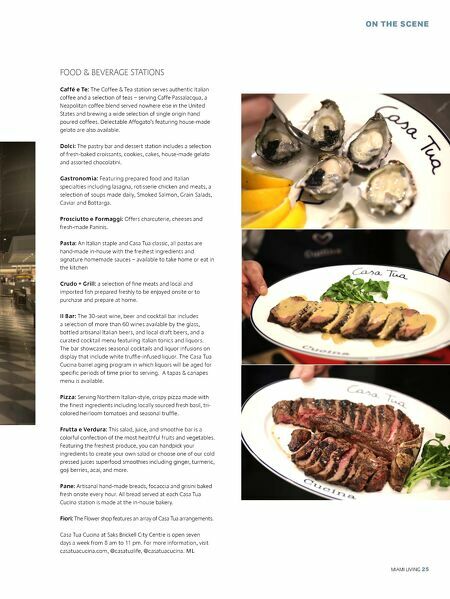 The 18,000 square-foot luxury eatery inside of Saks Brickell City Centre offers a carefully curated culinary experience, with 10 unique dining stations, a 300-seat restaurant, a full bar, flower market, and personalized home goods shop. "The kitchen is the heart of a house, it's where family comes together," says Miky Grendene, founder of the iconic Casa Tua Restaurant, Private Club & Hotel. "We believe sharing good, ethically-sourced food is one of the highest expressions of love. We have selected a group of passionate chefs from around the world to help us source the best artisans and small producers who pour their hearts into their work. Saks is the perfect destination to expand our presence in alliance with their understanding of luxury." Casa Tua Cucina forms a distinctive destination that offers customers a unique luxury experience. "Everything we do at Saks reflects what we call the New Luxury―the evolution of the traditional retail space into a lifestyle-centric destination which offers meaningful experiences to our customers―and our partnership with Casa Tua exemplifies this approach," says Marc Metrick, president, Saks Fifth Avenue. 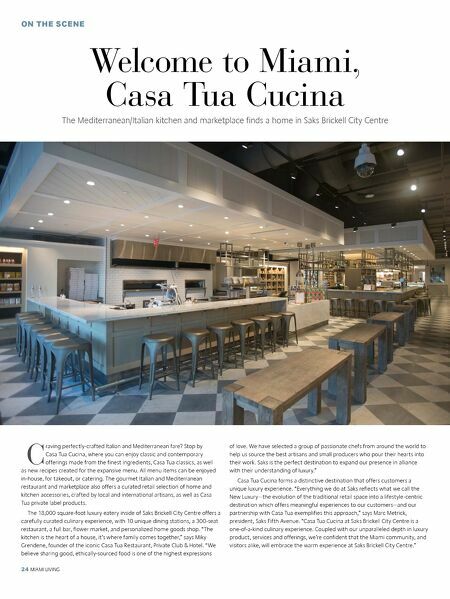 "Casa Tua Cucina at Saks Brickell City Centre is a one-of-a-kind culinary experience. Coupled with our unparalleled depth in luxury product, services and offerings, we're confident that the Miami community, and visitors alike, will embrace the warm experience at Saks Brickell City Centre."